The arrival of summer holidays usually sparks a migration between the big urban cities and the smaller rural and coastal regions as South Africans around the country head for home, the sea or the bush. Whatever the destination this time of year is often characterised by long road trips and time spent outdoors making it even more important to stay connected anywhere, anytime. Mobile devices are a lifeline, a connection to family, friends, work and play. This connection doesn’t stop when we’re out and about. In today’s world keeping mobile phones charged on the go is a life essential. The challenge with mobile devices has always been the need to stay continuously charged. This has required access to a fixed plug point or reliance on expensive and often inconvenient charging options. SunStream™ provides mobile electricity wherever you go, by streaming the sun’s power directly into your mobile phone. SunStream™ technology converts sunlight to electricity instantaneously at a 99% throughput rate, making it the most efficient mobile solar solution on the global market. Because it eliminates the need for circuit boards, charge controllers, or chipsets – components that are notorious for breakage -- the hand-held panel is extremely durable. This patented technology offers a reliable, daily solution for the mobile device user who has limited or no access to electricity. A necessary must have for the holiday season is the SunStream PLUS™. It offers half an amp of power, making it the ideal mobile electricity solution for smartphones, bringing some phones up to full power within two hours. The SunStream PLUS™ also powers feature phones faster than a wall plug and provides an excellent source of energy to power other digital and battery storage devices. 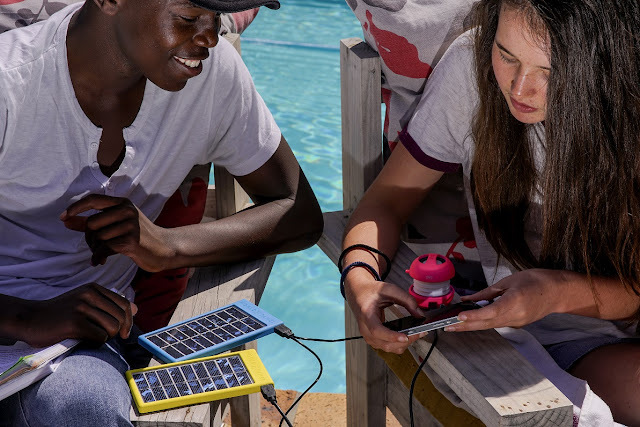 Whether as a practical, thoughtful gift or an essential life item, the SunStream™ solution offers a chipset free, fast charging (for multiple devices), portable, waterproof (it even works under water) and extremely robust advantage. It has been drop tested to two meters with positive results and comes with a shatterproof glass face, is heat-proof, freeze-proof and UV stable. No need to run around looking for a plug point. It’s as simple as connecting your phone to a SunStream™ via a USB cable and angling the panel directly towards the sun. So wherever you’re heading make sure you take your energy with you with the SunStream™. I felt touched after watching this video and I hope that it will have positive impact on all of you too. I feel I need to buy these for all the people in my life who comes from far rural area where electricity is still not available all the time. Based in Colorado, USA, World Panel Inc. is a triple-bottom line company (people, planet, profit) founded by solar expert and entrepreneur John Anderson. The company produces a line of mobile solar devices under the SunStream™ brand, with retail relationships on the African continent where mobile electricity is in high demand. World Panel’s SunStream™ products charge 2G, 3G, and 4G LTE handsets as well as most USB devices. Labels: aashish rai, Blogger, Builders Warehouse, Colorado, influencer, John Anderson, Mobile Charger, MTN, Photoyatra, Solar Energy, South Africa, Sun, SunStream, Thelifesway, Travel Gear, World Panel Inc.